Mike sent me an email Saturday night around 10:30, that I opened up this morning...."wx should be nice tomorrow; let me know if you are interested in getting up. given TAF calls for some am crud, thinking ilg around 1030a-noon". My reply at 9:20 this morning.....Mary is out with her cousin for the day and I’m available for the whole day….where are we off to? Give me a call. We soon hooked up via cell phone and we agreed to meet around 11:15ish for a flight south. I had a few places in mind and suggested KJGG, Williamsburg or the WV62, Windwood Resort in West Virginia. We decided on Williamsburg, JGG for a lunch run. Newport News is just a short hop and we could shoot approaches there, they seem to be accommodating, at least that's what I've read online. As I walked out to the plane the "Pipsqueak" an Aero Vodochody L-39 Albatross was taking off and it sounded great! I was to far away for the cell phone camera to catch much of the action and the Kodak Easy Share was in my flight bag out next to the plane. As if that wasn't a great visual with extra credit for sound effect the next plane landing on runway three two is a SNJ5 Texan, the "Naughty Nurse Nancy", which I remembered from our annual at Elkton, 58M. Heck, I didn't even get in the plane yet and I already was pumped up and ready to fly! Mike walked out to the ramp and he did see the Texan come in. He also got to see the L-39 as it made a low pass down runway three two and scream back out of sight another time, cool stuff! It was a good thing Mike focused on the pre-flight I was pretty much distracted to say the least. Mike filed for an Instrument Flight Rules (IFR) mission today. 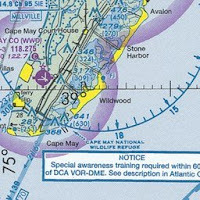 We climbed aboard and after obtaining the current ATIS I jotted down the CRAFT mnemonic for the essential elements of a clearance under instrument flight rules. 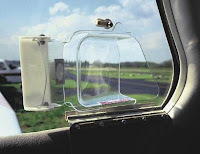 Transponder, the transponder code that must be set for the aircraft prior to departure and during the flight. Ok, it starts out with a call to clearance delivery or in Wilmington's case a call to ground. ME: Ground, Skyhawk 3525 Uniform Atlantic Ramp, information Lima, would like to pick up our clearance to Williamsburg Juliet Golf Golf, ready to copy. ATC: Cleared Juliet Golf Golf Williamsburg, on departure turn left 330, vectors, victor 29, Smyrna (ENO), victor 16, Patuxent (PXT), as filed. 2000 expect 6000 in ten, departure frequency 119.75, squawk 1502. We advise ready to taxi and they change our clearance. We are now departing off runway three two so they eliminate the left turn to 330 degrees. We taxi out and complete our run up then call ground to let them know we are ready. At Wilmington this is the procedure, ground then turns you over to the tower and they in turn clear you for your take off. 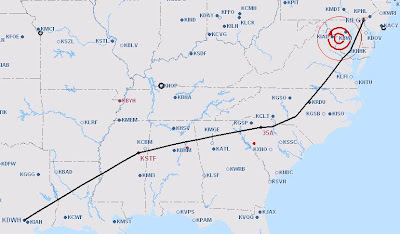 We launch out of Wilmington and contact Philly approach on 119.75 they direct us direct Smyrna (ENO) climb and maintain 6,000. Mike has me doing all the radio work and will jump in if I need him, it really has helped me get ready for my check ride. We get handed off to Dover Approach then Potomac who turns us direct CHOPS (an intersection) then as filed. It saved us some time and that's always a good thing. Potomac handed us off to Washington Center. Center was a bit busy or overwhelmed it seemed, he mixed up our call and at times was taking precious time to sort things out. I can't complain he gave us a nice short cut just before the PXT VOR and turned us on course direct Williamsburg, right through the Restricted areas. We did get 8,000 out of center then got handed off to Potomac and then Norfolk. 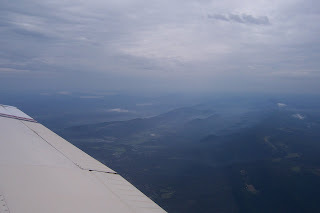 Soon we were descending for Williamsburg and I cancelled IFR about 5 miles out. Mike crossed over the field 1,200 above the pattern to set us up for a 45* entry to the left down wind for runway three one. I kept up with the calls had had fun watching the wx on the 496 and of course taking pictures! Down wind, base and final, we were looking good. I warned Mike about the JGG runway three one swamp monster but it seemed pretty smooth on short final today. We ballooned a tad then made a nice landing with the first right hand exit an easy turn. Of course Mike continued to beat himself up as we pilots seem to do so often. Charly's was open so we had a nice lunch. I had the Reuben sandwich and Mike wanted the chicken salad but they were out so he had the turkey on wheat??? I was to busy laughing to pay attention since he busted my chops about always writing up the food orders on my blog. Mike even took pictures for today's blog post. There is no courtesy car available at JGG and all the rentals were out so we decided on a taxi. Mike went to the pilots room to check wx and plan for our trip home. I looked over the wx then went out to check on the taxi. After a few loops back and forth I pulled up a seat next to an older gent and we talked flying. Nice guy, lived and worked in the Chambersburg area of Pennsylvania and had a pretty good knowledge of the Delaware valley. Our taxi van pulled up and we climbed aboard. I asked if he minded plugging in my Garmin 496 GPS, we were low on power with no cockpit power and I forgot to charge it up the night before. 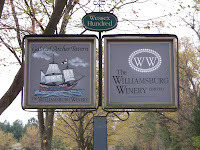 Not a problem he said and off we went for the Williamsburg Winery. We asked if he could wait on us so we didn't have to call him back, he agreed and gave us ten m inutes to make our wine purchase. Mike and I walked around checking out each type of wine, I had no clue because I don't drink the stuff. So, as all smart men do when trying to figure this stuff out we call our beautiful Brides. Mary didn't answer and I don't think Mike got through either.....we were on our own. Mary likes Pino Griggo, they had none, but I did pick up one bottle of each of the white wines I did see. Somehow I forgot to pick up the Spiced Wine which is the only thing I will drink and that's in a very limited quantity. We completed the purchase and made it out to the taxi in good time, we were still on the meter. It's only a very short ride to the winery from the airport but always a great stop. They also have the Gabriel Archer Tavern. The Gabriel Archer Tavern, as featured in The New York Times, is nestled among the vineyards with a beautiful countryside view. A nice place to eat and the food is good even if a bit fru fruie for my taste. Fru Fruie, is that a word? Anywho, we pile out of the van upon arriving at the airport and the next group is waiting to fill our seats. The ride to/from the vineyard comes to $13.00, it sure beats walking. Charlie was working the desk and he and Mike settled up on the fuel purchase. I remained outside listening to a bunch of locals, I would assume, just hangar flying. Some good laughs and nice folks. It was time to saddle up and head north, more of what I signed on f or. There is now a Ground Communications Outlet (GCO) available at JGG. Whats this GCO you ask.....The GCO functions as follows; A microphone key click signal from the cockpit triggers a dial-up, pre-programmed telephone call to the appropriate air traffic control facility. At JGG it will call Newport News with 4 clicks and FSS with 6 if I remember right. The pilot then receives the necessary air traffic control instructions without needing to leave the aircraft. Well that all sounded great but truth be told it didn't work. I clicked and re-clicked until my finger wore out. Mike and I switched headsets so he could use my bluetooth on the Zulu, Bose doesn't have that feature (Plug for Zulu's). He contacted FSS and we were good to go. We had a clearance time 5:10, and a void time of 5:20. We all did a watch sync at 5:01, it almost felt military like. Whats the term they use when they set their watches...I saw it on MASH.....Ahh yes...ok set time 1701 HACK. It's getting late and I'm tired, please bear with me. We decided on runway three one, which provided a launch to the north and direct route to our first point in our clearance HCM the Harcum VOR. From Harcum we had plugged in COLIN then PXT followed by ENO and eventually DQO. All these letters! Yep VOR names and even an intersection tossed in there, pilot type stuff. COLIN is an intersection followed by Patuxent (PXT) VOR then Smyrna (ENO) and on home to DuPont (DQO) at Wilmington. We did get a direct to change just shy of the COLIN intersection and proceeded direct to Smyrna (ENO)Delaware. We went through pretty much all the same approach hand-offs except in reverse order of the flight down. Washington center now had a really good controller online and he cracked me up. His response when someone called went something like this.....Skyhawk 3525Uniformmmmm....WAaaaaaasssssh. He did a real nice job and was very easy to u nderstand. Philly was the last controllers we would talk to before arriving at Wilmington. I contacted them when turned loose from Dover and reported tail number, ATIS info, altitude and level (even though I gave 7000 and we were at 5000). Philly asked to confirm our altitude,I acknowledged 5000 and I should have added I'm a dope [rolls eyes]. I asked for a practice ILS runway one approach and he Philly accomodated us. Our vectors were real easy, he turned us once, to the right about twenty degress to intercept the localizer and gave us an altitude to maintain and report established on the ILS. My next call was to inform Philly that 3525 Uniform was established on the localizer. We were then turned over to Wilmington's tower frequency. Wilmington Tower, 3525 Uniform on the ILS would like to circle east to land on three two. Wilmington advised report left base three two. We made our way in, reported and Mike greased another landing. A great day flying and a lot of radio work in the system to help build my confidence for my check ride. 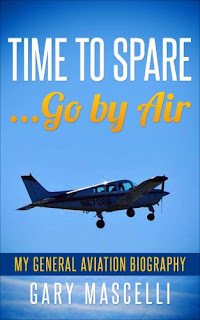 Mike really has helped me gain that confidence and I always seem to pick up something new from him to add to my tool box of weapons for flying. I can't wait to get back in the Archer and work on getting familiar with the Garmin 300XL for my ride......did I mention somewhere I really wanted a Garmin 430 for 679er??? Until the next adventure.....fly safe and have some FUN!! Mary and I will be attending the Labor day cookout at Woodbine. 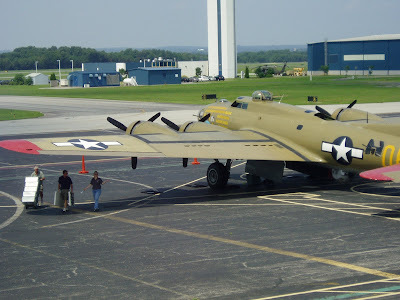 Stop in and meet some great people, eat then fly over to Cape May to see the Collings Foundation Aircraft on display. Another great night to be flying. MikeB called and we hooked up for an evening flight to shoot a few approaches, do some tracking and even toss in a miss with a hold procedure. Mike decided on Millville Airport and of course I gave the Millville radio painful sigh. We both laughed but stayed with the plan. I noted the ATIS at KILG for our pre-flight start up and once the fan was turning we set up our com/nav's. A quick call to ground, who seemed to be having a rough go with traffic this evening, and we were cleared to taxi to runway one via taxiway Foxtrot and hold short. As we were getting underway a helicopter air taxied by and landed across from us, sure gald we were inside and not out there eating all that cut grass and dust. Mike completed our run up and advised we were ready to go. I called the tower and we were given a "hold short". There was an Army Guard Blackhawk inbound, a Cessna something or other departing and then silence, I thought he forgot about us. I was wrong and he did clear us to take off on one, right turn out approved. Mike and I both called out the traffic that had departed ahead of us and we turned on course heading over the Delaware River. I did remember the camera so I have a few pictures to post. 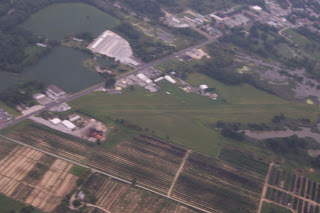 The picture of the grass strip is New Jersey. It's slightly out of focus but there is a yellow bi-plane parked there. The only wx I could find on the Garmin 496 was located out to our west south west around Baltimore. We kept on track for Millville and noted their AWOS also switching to the Common Traffic Advisory Frequency (CTAF) on 123.65. I kidded with Mike and said listen to this call to Millville Radio, I know it's now a game with me to see how little air time they can take up. Millville Radio Cessna 3525 Uniform, ten north west, with traffic and wx information, 2,500 will shoot the practice ILS RWY 10 approach. Millville responded, "advise LADIE inbound". Wow it worked! We did have traffic in the immediate area so I was really scanning while Mike was under the hood. We both wish we had the Zaon Portable Collision Avoidance System (PCAS) working but we had no external power in the cockpit that we could get to work. Mike made the procedure turn as called for and we were headed inbound. I made the call to alert Millville traffic/radio we were LADIE inbound and worked communication with the Archer also shooting the approach coming from the Rainbow NDB. I should add here that I made a point to also state my position for VFR traffic that we were on a 5 mile final runway one zero. As a VFR pilot (for now) I know what it's like to be in the pattern and pilots call out rainbow or LADIE inbound.....where the heck is that I think to myself. So the IFR guys should give some extra info to let the VFR guys know where they are coming from. I will say with all the instrument training I've been through I can hear certain intersections or NDB's and know where to look, same goes for those out of the way published miss points. It all helps with situational awareness to know where you fly or where you intend on flying to. I was literally head on a swivel looking into the evening sky and north east haze for the other aircraft, I never had visual contact with the Archer. Mike was rock solid down the ILS approach. I know I've said it before but he calls out everything he is doing and I get to learn from that, every little bit helps. We cross the missed approach point (MAP)and of course, go missed. Out to Cedar Lake VOR for a lap around the hold then inbound towards Rainbow. 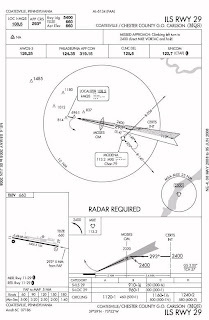 We break off from that approach and we role play ATC with me giving vectors back to the ILS RWY 10 at Millville. Mike did fine and I tried to keep the vectors to intercept as ATC would. The localizer came alive and we were tracking inbound. Glideslope was rock solid and I watched the Pappi lights glow with the correct pattern for the glideslope. This would be another missed but we would be heading back towards Wilmington. As we were heading back Mike thought about shooting an approach at Smmit (KEVY). As we approached the the Salem power plant and all its bright lights Wilmingtons ATIS was reporting Broken at 3'200. We figured on just shooting an approach back into Wilmington instead. The winds did start to pick up and there was a layer moving in over the river. I called the tower and advised our position and intentions with the correct ATIS noted. The tower gave us a straight in for runway one and I responded with a request for one four. Not a problem as ATC instructed us to enter a right down wind for one four. Mike gave me the nudge...."hey report mid field downwind" and I did. I was busy watching all the lights from traffic on I-95. Mike squared up the pattern and took us in for a nice landing and roll out. We exited the runway and taxied back to Atlantic. Next up some time in the Archer with Mike as my safety pilot. I hope to finish up with CFII Chuck sometime soon. Mary and I also have our trip to Stonington, Maine scheduled. It should be a fun few months of flying. The "Trip" is the planned adventure to pick up Jeff's new purchase, a 79 Piper Archer II in Houston Texas. The "Front" was the stalled weather front over the Appalachians that was held in check by Hurricane Bill. The "IR" is the instrument rating that remains to be completed that could have been put to good use and had us home on time Friday. Thursday started out very early as the alarm went off and I was out of bed at 4AM. I had already packed the night before and only needed to shower, eat and get to Wilmington Airport to meet Jeff and Lori for my ride to the Philly Airport. Mary extends her thanks since she didn't have to take me to the airport, even though she offered and was ready to go. I loaded up the SUV and needed to make a stop for fuel on my way. My favorite little fuel stop with home made goodies was closed so I went to the first place I could find. I pulled into the Airport parking lot and enjoyed the ice tea Mary had poured for me along with an everything bagel and cream cheese. Jeff, Lori and their two children pulled in shortly after I was parked, so I finished up and we transferred baggage. The Philly airport was pretty busy even at that early hour of the morning. We each had printed our boarding pass so there was no need to stop, we headed for the dreaded TSA security checks. Jeff cruised through with no problems but yours truly kept setting off the alarm due to all my new metal parts and wires. "Sir, please wait inside this area"....great I'm standing in the fishbowl looking three by five foot plexiglass room while everyone passes me by. "OK sir, please have a seat and we'll be right with you. the agent shouts "we have a male search here". Here comes my special agent complete with his magical wand. While still seated I extend my legs so he can wand my feet, that are still without shoes, thankfully I wore socks for this special occasion. Next is the stand on the footprints so we can see whats making everything chirp like a bird. Un huh, "sir, please remove your belt so we can place it through the machine". Ok not a problem, belt gone but now it's pat down time. Hey that tickles....no just kidding, I didn't say a word, those folks have no sense of humor. I had to empty out any gadgets in my clothing bag, a portable com radio and my mini Dell lap top computer then let them look through my flight bag. I got the okie dokie to put my shoes on and reload both of the bags. It was determined that I was not a threat to national security so I was free to travel about the country. Jeff patiently waited for me just around the corner and we finally headed for the gate. We were maybe thirty minutes from boarding so we stopped for a quick bite to eat. We boarded the Embraer 170 and prepared to get underway. I read my IR PTS study guide for the oral exam and took cat naps along the way. I did manage to take a few pictures of the building storm cells to the east. The pilot did a nice job as he landed into a cross wind, more so then usual since you could really notice it from the coach section. It was a short walk to the entrance and Chris, the soon to be former owner of the Archer, was going to pick us up. Chris was right on time and we loaded up our gear and headed to David Wayne Hooks Memorial Airport just 12 miles as the crow flies NW of Houston's KIAH, George Bush Intercontinental/Houston Airport. QualiTech Aviation, Inc. was not finished with the Annual/prebuy so Jeff had time to take a look at things, go through the logs a bit more and get additional info about the plane from Chris. The folks at QualiTech were really nice and I thought they did a good job of going over the Archer but I wasn't the guy they had to make happy. The three of us headed out for lunch and originally talked about a BBQ place but decided on the airport cafe'. I had some monster burger with mushrooms and cheese, fries on the side and the best big glass of sweet tea. Jeff had a burger and fries and I think Chris got the chicken fried steak. We sat and talked airplanes, always fun stuff, and the guys traded more good info/questions about the Archer. The plan was for a flight test to get familiar with the engine and fuel analyzer along with the avionicss in the plane. Jeff had already spent time with the Garmin 430 sim so he was up to speed and I know the 496 so we were covered. I hung out in the QualiTech office (air conditioning) while they both flew. When they returned we loaded up our gear and climbed aboard for the start of our journey home. 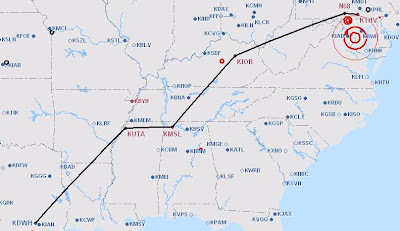 The plan for the first day was to head north east for KLMS, Louisville Winston County Airport, Louisville, Mississippi. From this overnight stop we would head to 35A in South Carolina for a fuel stop then north to KILG. The weather en route was so bad we diverted to KUTA, Tunica Municipal Airport in Tunica, Mississippi. We pulled up to the terminal and the lineman topped off the tanks, ok and spilled a good bit across the wing. The guy just looked at Jeff in horror then started cleaning up. The fuel that 93Zulu took on give or take a bit with the spill matched the fuel analyzer pretty much on the money, this was good to know. We headed in the terminal and the young lady at the desk made a reservation for us at Harrah's casino for $40 a night. We would need transportation but as it turned out there were buses running to shuttle people to Harrah's. What people? We were the only three in the place besides the line guy. No sooner those thoughts entered our heads an Allegiant Air 737 from Cleavland was rolling down the runway and pulling into the terminal. We lined up with those passengers to board the bus, no we didn't just wiggle our way on although that would have made for a great story, instead the guy running the shuttles agreed to gives us a ride if there were seats available. Well, there were no seats, but, there were four other people in the same boat. A short time passed and Harrah's sent out a black stretch limo for the six of us, hey pretty cool and it was a free ride. Day two of our journey home and we once again try for the 430 mile east leg to 35A Union County Airport, Troy Shelton Field in Union, South Carolina . We had a quick breakfast at Harrahs in the coffee shop then called for a cab to the airport. Our suspicions were confirmed now with daylight p roviding the view of vast nothingness. I mean there was nothing but the roadway for miles. The airport had a convention center across the highway but that pretty much was it. We launched with high hopes taking advantage of tailwinds and cruising along at 145 knots. Unfortunatley, not long into this leg we are avoiding cells. ATC is really helpful and the on board weather confirms what the two sets of eyeballs is looking at. We turn south for an end around attempt to clear a large cell slowly moving north but the surrounding layers don't look good either. Jeff and I discuss our options and agree it's time to get on the ground and re-evaluate. This decision was timed perfectly with a very large opening that you can see in the above left photo that we descended through with plenty of ground contact. 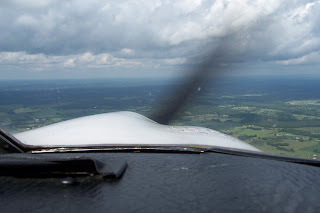 As we made our way down we also headed a short distance to one of the day one potential stops KMSL, Northwest Alabama Regional Airport, Muscle Shoals, Alabama. Just 135 miles into the day two leg our plan was coming unglued and our alternate plan of running the west side of the Appalachians was looking to be the best choice at this time. We use the courtesy car to run for lunch and hit the Tex Mex restaurant, Rancho Viejo. We ate our meal and discussed our options as to what we thought would be the safest route home. This wx front was stalled and blocking us from the east coast run north and now we would have to settle for our back u p plan. We finished up lunch and gulped down the last bit of ice tea. The food was good and the service very fast. We headed back to the airport to top off the tanks on 93 Zulu. 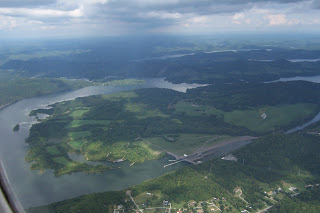 Once again we launch but this time we are headed north to KIOB, Mount Sterling-Montgomery County Airport in Mount Sterling, Kentucky. This 265 mile leg is much better but with wx still giving us fits we call it a day knowing we can't make Wilmington, Delaware by nightfall, besides,the wx at KILG is Instrument Meteorological Conditions (IMC), a no go for the both of us. Jeff cancels flight following once IOB is in sight. Another super smooth landing and we taxi to a tie down area away from the main ramp. The manager comes out to help us tie down and shuttle us back to the terminal building. We are given the courtesy car along with directions for the Fairfield Inn. The Airport Manager Paul gives us his card and said if you have any problems just call. We loaded up the bags and headed for some food and sleep. Jeff is driving I'm navigating well trying to. As we leave the road from the airport to the main road the car died, yep, traffic coming, nose sticking out there and no can start. I jump out, a real sight to see, and start to push while Jeff opens his door and pushes with one leg out and one in still seated and try to steer us backwards to clear the oncoming p/u truck. The keystone cops has nothing on us! Jeff cranks this baby a few times with no luck, finally it starts and he combines the brake and gas to get us across the road into a gas station. I called Paul to let him know we had a problem as Jeff pumped in $15 or so to move the needle off the 1/4 tank mark. The car fired up ok and it seemed to run so I called Paul a second time to give him the all clear. The gauge must be broken because it ran ok after the added fuel. The Fairfield was a good choice and the young lady working there gave us a great suggestion for dinner. Terry & Kathy's On Main was the choice and off we went. We each had the filet w hich was cooked perfect along with home made mashed potatoes. There was no room for dessert but we took two slices of Key Lime pie to go. Yep, the pie was excellent too. Day two comes to a close and I passed out while the TV was still on. To Jeff's horror he got to hear me snoring. Mary warned him that when I'm really tired I snore. When we got up I asked if I had snored very bad, his look was priceless and his words were, "Oh My God! I thought you were going to swallow your tongue or something". I'm still laughing as I type this. I'm really sorry Jeff! lol...honest! We both manage to get up early in hopes of making Delaware today. The wx is looking really bad at Wilmington and in Dover too. There will be no crossing the Appalachians from this point so instead we alter the plan and head 350 miles for KTHV, York Airport, York, Pennsylvania. The weather at Mt. Sterling was perfect, 61 degrees with a light cool breeze and clear as far as one could see. It was to good to be true. We sat on the ground in order for our destination airport conditions to improve. We launched for York figuring to arrive just past the Terminal Area Forecast (TAF) best weather scenario. The ride was perfect, cruising along at 9,500 feet averging between 150 and 160 knots, outside air temp was 36 degrees (we had to close the air vents)with xm radio playing the hits and the sky was looking great. I think I even heard Jeff singing despite moving his mic up and out of the way so I wouldn't hear him. Flight following handed us off one at a time as we talked with Lexington, Indy center, Clarksburg and a few others along the way. As we approached the Saint Thomas VOR we needed to descend for cloud layers to maintain Visual Flight Rules (VFR). The xm radio was muted, and our alert status was raised a notch or two. 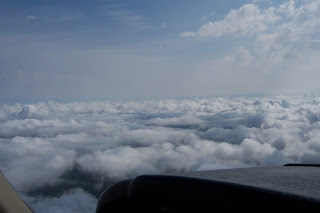 We had crossed the Appalachians and had entered into a valley where the cloud layer really was closing in so the decision was made to divert to N68, Franklin County Regional Airport, Chambersburg, Pennsylvania. Not a very friendly place unless you had a parachute strapped on but it provided a place to land and give us the chance to re-evaluate on the ground with our charts spread out and no pressure to fly the plane. We sat and waited for the conditions to improve. Finally looking to the north-north east we could see the last ridge lines separating us from our target destination of KTHV, York, PA. A final look at the sectional and a plan to cross was completed. As the plane full of jumpers departed we were number two to bug out. We headed north east shadowing the ridge line wanting to avoid the top elevation of 2,120 and the additional tower elevation to top out at 2,513 feet. The cloud layer was three to thirty four hundred and safety was the main goal here. 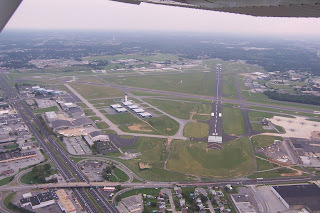 As we approached N42, Shippensburg Airport we made a right turn direct to York. Our highest elevation was 1,622 and we were passing overhead at 2,700. York was in sight as we announced position for entry. Another aircraft was on a three mile final so Jeff made a right 360 for spacing and re-entered for our landing on runway 17. Another good landing in the book. Jeff has family in the area so he arranged to borrow a vehicle for our final leg home, on the ground. We gave the last hop some thought but Wilmington was still under the weather so the safe choice was indeed to ground pound it home. I can't count how many times durning this trip we each mentioned the need for the instrument rating. I'm calling/texting Chuck this week, Jeff is going to take his written test in the next couple of weeks. We went out to dinner with Jeff Sr and Peggy at Smokey Bones, a great place. After dinner we went to their home and visited for a short while then saddled up for Delaware. It was a good ride home despite the Lancaster traffic which made us both wish we were still flying. Jeff dropped me off at the Wilmington Terminal to pick up my SUV, which I had left unlocked but all was intact. We parted ways after a hand shake and each shared a big smile as we savored the journey and lessons we learned and shared. 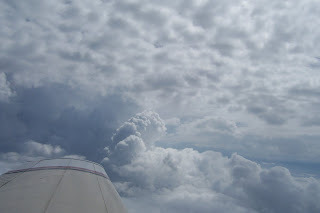 It was a great time, I learned more about weather then I ever knew,along with the 'real' art of flight planning and most of all the adventures associated with diversions. I think tops on my list is the fun flying with a fellow pilot and friend as we brought his new baby home, well almost home. 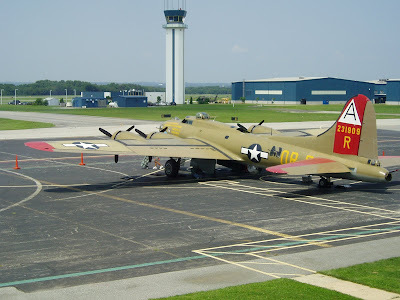 What a great sight to see while looking out my office window.The Collings Foundation B17G, "Nine O Nine" was turning left base to final for runway 19 at ILG this afternoon and it was in perfect view out my office window, and the boss wonders why I stare out there so much. This required an immediate road trip to um....check on my Airport Terminal project....yeah that's it, the terminal HVAC project at the Wilmington Airport Terminal, hold my calls. I only got to take a few pictures since everyone on the OP's staff was busy and I didn't want to get in the way. The Wings of Freedom Tour is in town for a few days. 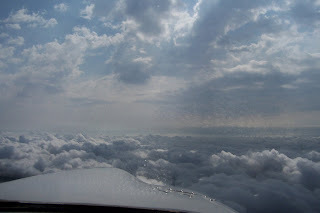 This morning I got an early start and was wheels up out of Wilmington (KILG) by 8:30AM. The plan was to pick up BobC and get him back to his plane that was still on the ramp at Georgetown (KGED). Bob was stuck in Delaware due to wx this past Thursday and Friday. It was very hazy today, typical north east. I didn't bring along the camera, I don't know why, I just forgot. We departed Wings field and contacted Philly approach for bravo clearance. Philly was busy today but picked me up on my second call. Philly approach Archer 28679er - 28679er standby, (never a good sign), Archer 28679er Philly approach - Approach, Archer 28679er 5 south of Wings, 1,900 climbing 4,500 VFR to 3 3 November request flight following and bravo clearance - Archer 679er squawk #### and say altitude request - squawking #### 4,500, 679er. We were on our way through the Bravo. I was handed off once to 119.75 and she also asked my requested altitude........4,500, 679er. We were good to go. Somewhere south of Wilmington, maybe around the C&D canal Philly handed us off to Dover. I responded 132.42 have a great day - Dover approach Archer 28679er level 4,500. Dover gave us the current altimeter reading and we dialed it in. I soon had 33 November in sight and cancelled flight following. I positioned myself to cross midfield at 2,000, 1,200 above pattern altitude. Announcing my position we circled and entered the left down wind portion of the pattern. Base to final, over the electric wires and another good landing in the log book. Jeff climbed aboard and we launched for Georgetown. It was really ugly hazy today, I know I mentioned it but it was so bad I needed to say it again. Jeff handled the comms and picked up flight following for the KGED hop. We were assigned a squawk number only to hear another aircraft already squawking that number....Hmmmmm. Jeff, in typical Pilot In Command style quickly advised Dover of the squawks codes and similar tail numbers and requested that we use full call signs. I think Dover got ticked but tuff luck, it's our lives up here while they sit in the A/C tower. We were given another squawk number, the troublemaker dialed it in, just kidding Jeff, ya done good and kept everyone squared away. We had a Falcon jet pass on by and enter the left down wind for runway 4 at Georgetown. Jeff offered to extend our downwind so he could get in first. We had position and could have gotten in but with his speed he would have had to go around. I chugged along watching the falcon jet cross base well out in front of us and I extended my downwind. As he came by our left side I turned base and made my way in, number two to land. There was a Cessna behind us and he followed number three to land, we all played nice nice. Another nice landing in the book and clear of the runway in time for the high winger to land with no problems. We parked out front on the busy ramp and then made our way inside for breakfast. I had an Omelet, Jeff had one too, Bob had eggs Benedict. Food and service is always worth the stop at KGED. Jeff and I did some flight planning and we will carry two routes, the east of the Appalachians and west side run, actually the west run was an hour shorter. We had seen enough and felt like we were ready. I am going to take my small Dell computer for flight planning at the hotel and updating the blog while enroute. We all went out and completed our individual pre-flight. I took on 15.7 gallons of fuel to top us off since it was just two of us we would be fine. 679er was soon screaming off the runway climbing out in Gary fashion when I heard MikeB's voice in my head saying cruuuise climb....and so I did. After we departed the pattern I gave Jeff control. He took us into 33N and transferred control back to me on final. Another good landing maybe a titch slow on very short final but gentle none the less. One of my pilot friends is in the process of purchasing a 1979 Piper Archer II, sound familiar? Well, it sort of is. I fly a 79 Archer II also but this Archer is in Texas and is loaded with a great avionics stack of goodies. Ok, let me back up here and fill in the details of the story. Jeff and I met through flying and we have safety piloted for each other on a few occasions, we also attend North East Flyer events. 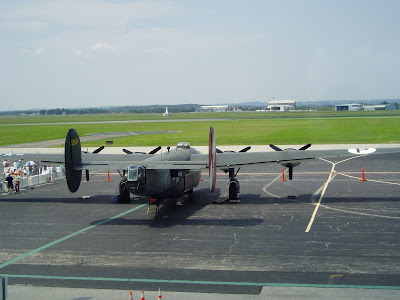 Our first real trip together was our flight to the aviation mecca, First Flight in North Carolina. What a plan that was with the family members getting sick, going from a two plane flight to one plane and me driving to meet up and fly with Jeff. August of 2008. Jeff went to the airport to cut the grass around his aircraft only to find out the airport maintenance folks already cut it. They also dinged his plane in a few places bad enough to warrant repairs and did not report it. His annual now had added repair work that needed to be done. Jeff and the airport did work out the details. Read his post here. March 2009. Jeff headed out to the airport this day only to find there was an accident involving a rented Piper Warrior that had crashed into two planes, Jeff's Cherokee 180 and a Cessna 337 Skymaster. News report and NTSB report. Ok Fast forward back to present day. Jeff was interested in joining the club I belong to but the last slot was filled a week or so prior. The new member was in on a two month trial basis and was not sure he was going to stay on. Jeff was next in line to fill the spot. Well, two months have gone by and Jeff was really needing to get in the air. He and his family vacationed and while away he completed his BFR. When he returned from vacation he swapped some emails with the club owner only to find there was no status change. There was however some talk about a possible sale. This talk got the ball rolling and Jeff resumed his search for a late 70's early 80's Archer. Every pilot scans the trade a plane ad's and every other service online that lists aircraft for sale, it's what we do. Hey were pilots, we dream big, what can I say. After trading phone calls and looking over links to various aircraft Jeff calls to tell me he his pulling the trigger on a 79 Archer II located in Texas. This aircraft has the latest avionics which makes it a rock solid Instrument Flight Rules (IFR)bird. The wheels start to turn, Jeff makes the appropriate calls. Of course I wanted to be the first to offer to right seat for him if he needs to make a road trip. I'm covering the bases here, I can hear it in his voice this is going to happen. His plan was to fly down with a CFI but I assume the timing didn't work out. This opened up a chance for me to make the trip. I'm excited to say the least! I called Mary and asked her what our plans were for the weekend and she said it was open. I updated her on Jeff's purchase and let her know I had the chance to fly with him, she said you boys go have fun. So far we have our one way tickets to Houston in hand and we will be leaving Thursday morning bright and early at 7:35AM. We talked about a potential route home and stops along the way, neither of us wanting to really fly at night since we have four days available for return. The flight plans for nine or ten hours depending on the winds aloft. Initially we plan to spend Thursday night in Starkville, Mississippi then fly home on Friday, everything weather dependent of course. I asked Mary if she wanted the link to track our progress home if our flight gets posted on Flight Aware and she said no, just call in. That works for me, I'll keep her updated. 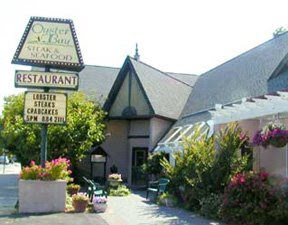 I asked my Bride if she would like to have dinner at the Oyster Bay restaurant in Cape May, NJ. She thought about it, for maybe 3 seconds and said it's a great idea. We made plans to shower and change around 2pm, head to the airport by 3pm and be wheels up around 3:30. Mary spent the day working on her sun tan in the back yard while I watched the replay of the Phillies game last night. I also putzed around on the computer for awhile. I scheduled 679er from 3-8pm and set my flight, garmin and Marys headset bag near the front door. I also grabbed the camera, but forgot to charge it. It was a great day to fly with a nice breeze to cool things off. We uncovered, I took on 21 gallons of 100 LL and climbed aboard when the fuel check was completed. The Archer started up an everything looked good to go with cool air from the big fan rushing in the kool scoop window and cabin door. 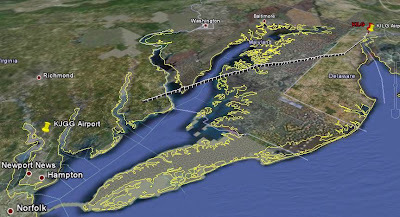 I contacted Wilmington ground and advised ready to taxi, VFR departure south east to Cape May, Whiskey Whiskey Delta with information Hotel. Same response as always, taxi to runway one niner via Kilo, hold short contact tower when ready to go. I acknowledged all commands and released the brakes. 679er was off in short order climbing to the south. At 700 feet I made my previously approved on course left turn to one five zero degrees and leveled off at 3,500.It was typical north east haze but I have seen worse, at least the cooling tower was easier to see today. I tuned in Dover approach and listened in but did not call for flight following. I like to switch to Millville Radio in order to keep tabs on traffic. Once clear of MIV I flip to 122.7 cape may CTAF. This frequency is shared with Chester County, queen City and a at least two other airports, what a pain in the ear. It was good to have the Zaon PCAS on board today, it picked up two targets. An aircraft was passing overhead about 1500 high and it tracked him solid and I did get a visual on him and the other was 500 feet below and never saw him. I think he went into one of the many grass strips between the Delaware river and Millville. 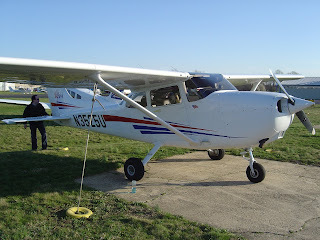 There was a Cessna 150 departing Cape May a nd we traded calls to locate each other. I was five miles out when I heard him depart and never did see him. When I announced short final for runway one zero a young lady stumbled through her calls but got her point across as she announced her position. She was following us in to WWD and was entering the down wind as we touched down. I did notice today that the stall horn did not work and I had once again rode a nice landing, setting the nose wheel down well after the mains. I made the first right hand turn off and found a parking spot up front at Big Sky, the FBO. Mary and I walked in and asked for our rental, it was ready and waiting. The man working the counter said it's the small red one. Oh my, I took the compact but now I was worried. As we walked out to the lot I said to Mary he wasn't kidding, it must be small, I can't even see it! It was parked out of our view but we finally walked up to the toy car. The chariot for tonight's date was a red Chevy Aveo. The Archer had bigger tires! It started up and we piled in, it actually was pretty roomy up front. It was all plastic and it made some funny sound, it must have been the rubber band unwinding. The toy car got us to Oyster Bay in great time and we were the first couple to walk through the door. We had a nice cozy corner seat by the fireplace and a very good view of the entire room. After going over the menu's I decided on the shrimp cocktail for starters. Mary had the special salad with mozzarella cheese with prosciutto, peppers and balsamic dressing. We both ordered the house special, surf and turf. 8oz fillet cooked to perfection with a half lobster stuffed with crab meat a side of mashed potatoes and green beans. Mary passed on the potatoes. The food and service was excellent!! We finished up diner and very briefly gave dessert a thought. We decided to order two slices of a mousse cheesecake with the bananas foster packaged on the side, both to go. Like two little kids we carried off our treasure and made for the hot rod, um, I mean the toy car. The key did work and it even started again, I didn't even think to rewind the rubber band. I shouldn't complain, the rentals from Ace Sharper have always been good for us and the rate for the wind up car was only $29.99 plus tax. Traffic was light as we made our way back to the airport, enjoying the sites along the way. Mary and I walked out to the plane and loaded up our special treats. I did a walk around and checked my fuel status then climbed into the left seat. Mary followed and we soon had 679er ready to taxi. I watched one plane land and another take off as I completed my run up. We were next up and rolled on to runway one zero and advanced the throttles for takeoff. I climbed out and held off on my turn north giving some added space for the neighbors below. I was tracking the DuPont VOR on a 330 degree TO heading. The Garmin 496 was programed and I decided to dial in the direct to on the panel mounted Grmin 300XL. Something didn't add up, the 300XL kept showing me a 152 degree heading to Wilmington but it was 180 degrees off. It also showed a dotted line for my course instead of the solid line. I thought maybe a satellite problem but my G496 was going strong with weather and traffic running. I recycled the 300XL and it came up the same way. Not sure what that was about but I'll check the manual tomorrow. It was fairly smooth going home and Mary was soon fast asleep, I didn't even get to flip the switch to isolate. I teased her and said she had puppy syndrome, full tummy must take nap. I continued on and once again gave the 300XL another chance to provide good info, this time around it was perfect. I was already tracking the DuPont (DQO VOR) anyway but it's always nice to have a second or third backup. I widened the view on the Garmin 496 and saw shower activity moving into Lancaster, PA (KLNS). I didn't think we had any worries and continued on enjoying what we could see of the upcoming sunset. Winds had slowed down from the first ATIS check to the most recent now reporting winds 170* at 3 knts. After announcing my position the tower advised I had the option to enter a right base for runway one or left down wind for one niner. I took the slight tail wind and advised I would be entering the right base for one and landing long for Red Eagle, the tower acknowledged. We were home.....what a nice trip! The opportunity a plane provides is endless, seriously, what a great date night. As a side note I should mention that the average drive time for this night out would have been two hours each direction with no traffic. Our average in the air time, each direction, was 28 minutes and maybe a ten minute drive to/from the restaurant and airport. Date night with my Bride...PRICELESS!! MikeB sent me an email around 4:30 and I didn't check my email until 6:00. I replied that I was a go for flying tonight, give me a call. The house phone rang and Mike asked what my new cell phone number was, it was not the one I sent out in the email. I must have brain farted and transposed the last four. We got that squared away and I resent my original email noting the brain gas bubble. We both headed to the airport as soon as we hung up and planned for a local flight to shoot a few approaches. 25U was brought out to the ramp and we loaded our flight gear, pre-flighted and hooked up the G496. We both wanted the wx on board with so many local favorite airports showing marginal vfr and IFR conditions. The clear area for flight seemed to stretch to Lancaster, PA and as far south as Dover, DE. The favorite stops along the Jersey shore were IFR so we decided to stay in our own backyard for some fun. We launched off runway three two and climbed out into a very nice looking sunset. I did get one picture tonight, although I once again forgot the camera, I did have my cell phone. I handled the communications for the flight and Mike went under the hood so I could vector him for the ILS 29 at KMQS, Chester County. Once we left the Wilmington Delta airspace we dialed in Chester County to monitor traffic. 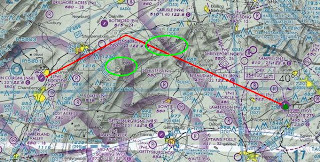 I vectored Mike to a final heading of 330 degrees, maintain two thousand four hundred until established for ILS 29 Chester County. We role played ATC and that really helps me as an instrument student get comfortable with the proper radio calls. Mike calls out what he is doing when shooting the approach and I follow along while looking and listening for traffic. We had a Cirrus inbound five miles east for the ILS 29 approach. I did not see him and we were closing in from the Modena VOR (MXE). I advised were were going to do a 360* turn and re-nter for the approach in order to give the cirrus room. The cirrus next reported EFECO inbound which is five miles, his first position report was incorrect, he was more like /nine or ten out to the east over the CERTS intersection. Oh well, we continue inbound. Mike calls localizer alive and turns on final, tracking very smooth. As we now approach EFECO the Glide slope is alive and mike intercepts. I know it's bizarre but I always here "down the stretch they come" in my head once on the needles, my way of keeping my head in the game and stepping up my focus. Mike goes missed as we exchange position reports with the Cirrus. It's great when everyone talks, a lesson for Millville radio on how airport communications can work. Next up I take control for the same approach. Mike role plays as ATC vectoring me back to get me in position for the same ILS approach. I felt pretty steady once I got the hang of 25U when turning and she needs a bit of foot to the left rudder to keep squared away. I did pretty good until short final getting a bit heavy handed with aileron control, feet feet feet, soft rudder corrections only. I end up going missed and once turned out towards the Modena (MXE VOR) command is transferred back to Mike. We role play ATC again and Mike ends this approach as a full stop. We pass on making a food stop even though Mike hasn't had dinner, I ate before I walked out the door. We taxied out to runway two niner for a south departure back to Wilmington. We scared off a fox that was running along the taxi lights even though it hung in there contemplating make a dash across in front of us. I made the call that 25U was departing two nine Chester county as me rolled into position. The landing lights lit up a small heard of deer maybe 6-8 just off the approach. Mike reconfigured for a short field just in case any Bambi type critters wandered out across the runway upwind of our position. We jumped into the air in short order, man that Cessna gets off quick. As we climbed out a Mooney announced his position south of the field maybe five or six miles I can't remember and he was heading north bound at 2000 feet. We were climbing through 1,600 for 2,500 heading to the south so I announced our position as well. I ended up spotting the Mooney at our two o'clock maybe 500 feet below as a dark streak across the sky. When I called the Mooney in site I noticed his strobes lit up. I couldn't spot that one again if I tried. Mike transferred control back to yours truly for the ILS 1 approach for Wilmington. Mike was working communications, I was eyes inside on the instruments. Contact with Philly approach had us squawking and talking. I followed the vectors for the ILS and did a pretty good job from the right seat. Philly turned us in a bit tight with the last vector and advised maintain at or above 2000, join the ILS 1. I hope Mike jumps in here to correct me because I can't remember exactly what they said but it wasn't the norm. Mike thanks for the email getting me squared away. I try to be exact, it helps me and others who read along. Here is what Mike sent me...ATC "join the localizer", a common phrase to do just that. Fly last given heading 040 degrees (and altitude) to intercept and track the localizer inbound (15*), from there expect to be cleared for the approach. 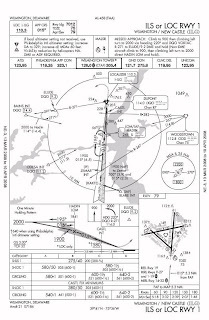 Joining the localizer does not consititue being cleared for the approach, which came afterwards,25U cleared ILS maintain 2000 till established blah blah, when we get close to FAF, the hand off to tower comes. Contact Tower one two six point zero which I like to say 26 even, appreciate the help/practice 25U. I then flip flop on the coms and make the call; Wilmington tower Ces 3525U with you on the ILS, full stop (full stop - only needed in practice - real world you are not going back for another. If you did that would be, 25U is going missed (a required comm report). There are 6-7 required reports - a good oral question. Once established Philly did turn us over to the Wilmington tower. As previously agreed Mike took over on short final and when I did look up I had us on the money looking down the runway. I made gentle corrections with the feet and it went much better. We buttoned up 25U and each headed home, I hope Mike got some dinner. Ok, required reports..... 1)vacating assigned altitude 2)missed approach 3)change in airspeed +/- 10 kts? 4)arrive/leave hold 5)arrive at clearance limit 6) unable to maintain 500 ft/mn climb or descent.....and I forget the rest, so that's my homework assignment.